Normally when we go fishing, we expect to catch fish, right? Well, that’s not what happened yesterday – at least not at the beginning. I was trying a new technique for Homer, Alaska. Nobody and I mean NOONE casts for Halibut. They anchor, put down weight and meat, usually deep, and wait. Being unorthodox, and from Minnesota, I think differently. I know halibut are shallow; they are predatory; they have teeth; they will chase and bite. 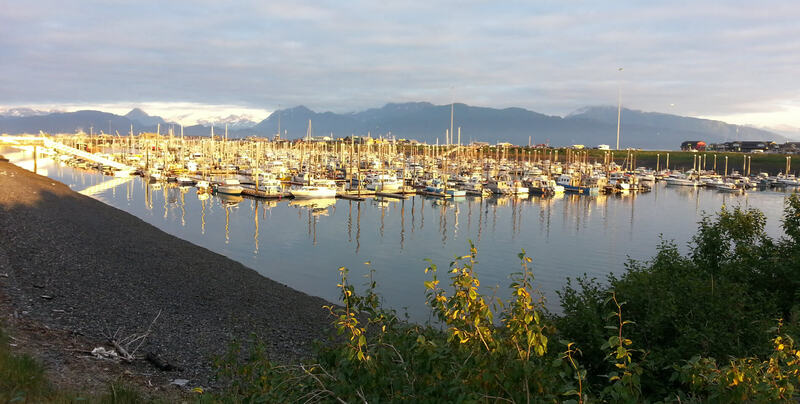 So, I’m out there on the shallow rock flats – where Halibut hunt for crabs, and I’m casting a Magnum Rapala. There’s this Herring Gull, and he won’t leave me alone. Every time I cast, he thinks I’m throwing him food (they are conditioned that way around here). In fact, usually when you drive out to fish, there is a gull following you. The squack as if to claim “hey all you gulls, this is MY boat, so stay away.” Sometimes they get bored and leave for greener pastures, but usually, they wait and wait. They know that when boats get ready to leave, they take the bait off of their hooks and throw it in the water. In this case, I was casting “the bait” and the gull was confused by it. Every cast, he would chase the bait through the air, land next to it, and try to grab it before I took it deep. There wasn’t much I could do. You can’t get rid of gulls (there are ten thousand within a few miles of Homer); I sure wasn’t going to quit fishing over it. Seems this gull needed to learn a lesson. Lucky for him, I didn’t set the hook too hard. Gulls are remarkably light for their size. 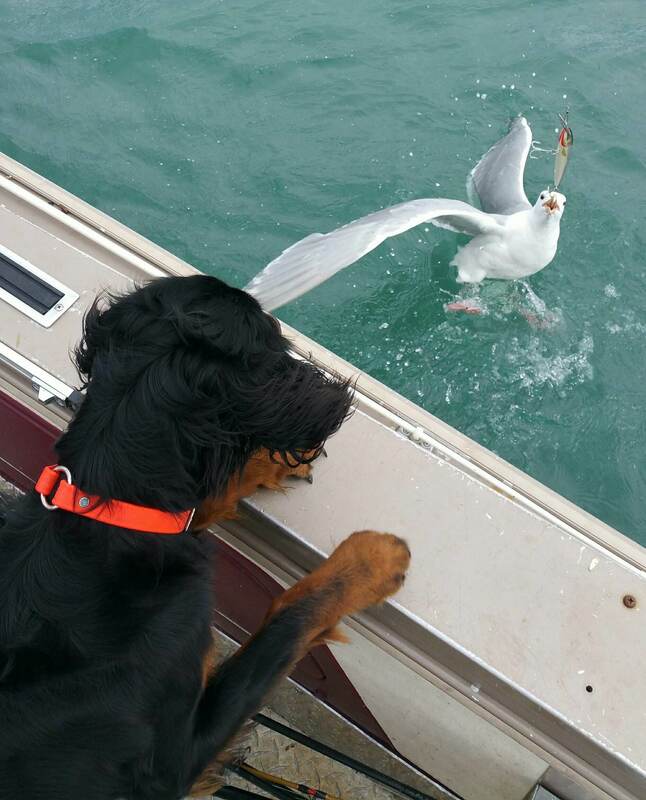 He didn’t put up much of a fight, but some of it was aerial, which was interesting 🙂 Sam Elliott was pretty interested when the gull came to the boat. 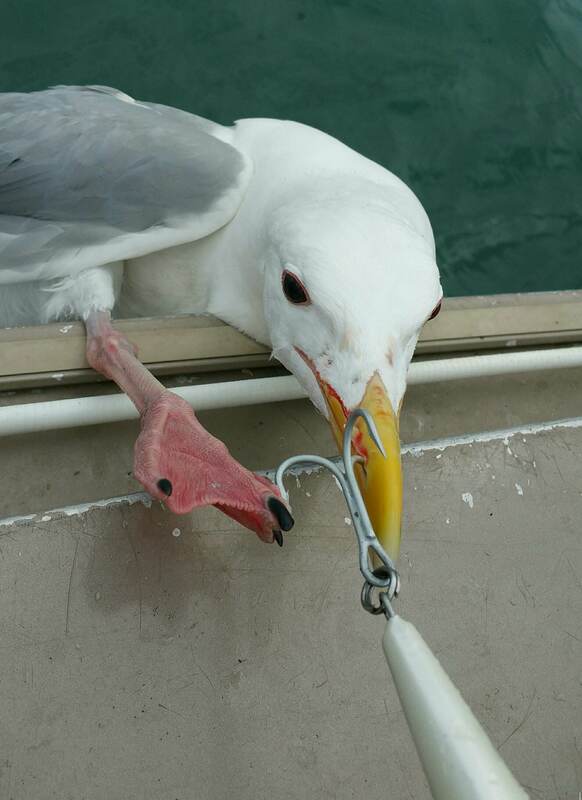 The gull got a saltwater treble hook through his right nostril – so a bit of a bloody nose, or should I say, beak – but otherwise, he took off none the worse for the wear – and I expect that will be one gull that will leave me alone from now on. Today is a cloudy, rainy, poopy day, and a good opportunity to get some stuff done on the homer front. I helped Maria feed sixteen people breakfast. While they checked out, I cleaned the kitchen, did a couple loads of dishes, and re-set the table. I can just hear all you ladies sighing, your hearts fluttering away. HELL YES, I’m quite the catch, and Maria better know it! Before role reversals was every a thing, and before EGALITARIAN was ever a word – my momma taught me to clean up a kitchen. I’ve been catching lots of halibut lately, and the fridge downstairs was getting full of bowls of fresh fish that needed to be vacuum-packed and frozen. We also used up the last few pieces of smoked salmon – so it’s a “putting up fish” kind of day. 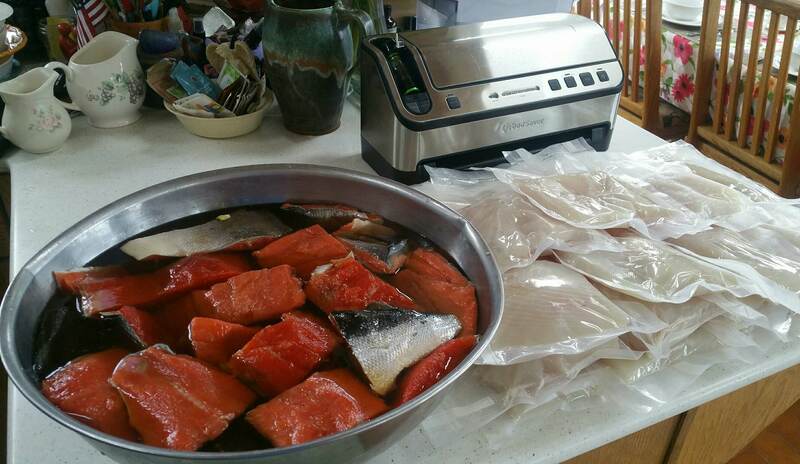 I packaged and froze about 30# of halibut fillets, and mixed a brine for a batch of smoked sockeye salmon. The Salmon? OMG is it good. It will come off the smoker tomorrow, and the house will smell amazing. Guests will check in, and it will draw them in tantalizingly. Once they try a sample, they will want to have some for their day trip lunch, or for their road trip back to Anchorage. Some will even take a bunch home with them as, once smoked, it keeps quite a while. Well, it’s been raining all morning – but my chores are done, and I think it is clearing a little. Getting brighter anyway. I have good rain gear and the “butts are biting.” No trips today, so it will be Sam-E and me. He’s my co-pilot, my first mate – and good company when I’m fishing alone. Stay tuned for tales of adventures from Ben and I. He will be tagging along on some of my trips, or, he and I will go out on our own before or after my scheduled trips. We will be putting up some salmon and halibut for Ben to bring home (he’s quite the cook and health-food nut now). 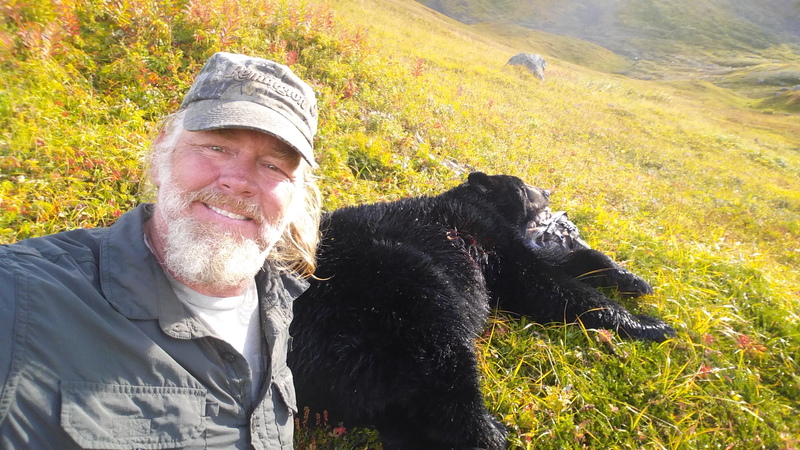 I hope I can also con him into a bear hunt. I need a good strong young man to climb a mountain and help me pack a big beast back down to the boat. Ready for it, Ben? I also want to explore Lake Tustumena, the head of the Kasilof River – where brown bears abound. I need a back up gun 🙂 Maybe we will even get a big one like the one I got last year.